A popular grade for toolmakers, this tool steel is used in a wide variety of tool making applications. Typical applications include punching and blanking dies for stainless steel sheet, brass, copper, zinc and hard abrasive materials generally. Other application suitable for this tool steel include deep drawing dies, cupping dies, forming die sheet metal forming rolls, shear blades for strip and sheet including flying shears, circular cutters for cold rolled strip, trimmer dies, thread rolling dies, cold extrusion dies, broaches, plug gauges, ring gauges, master hobs for cold hobbing plastic moulds, cut moulds for plastics, special taps, straybolt taps, brick and tile mould liners. a. Good processing, heat treatment size stability. c. Excellent dimensional stability when hardened. d. After hardening and tempering, the high surface hardness match well with the toughness of the body. 2. 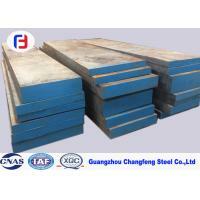 We have full stock with a variety materials, guarantee delivery is in short time. 3. Good Quality + Factory Price + Quick Response + Reliable Service, is what we are trying best to offer.